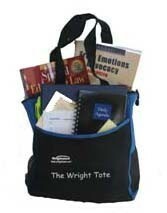 The Special Ed Advocate is a free online newsletter from Wrightslaw. The newsletter provides accurate, up-to-date information about special education legal and advocacy issues. Our goal is to help readers navigate the confusing world of special education and get quality services for children with disabilities. Our Mission. The 2004 Archives includes links to all issues of The Special Ed Advocate newsletter published in 2004. To read issues published since April 1998, please visit the Newsletter Archives. December 20, 2004 - Free tutoring & tutors for kids; free special ed advocacy course; free professional development workshops; alternative routes to teaching; free shipping, price cuts, autographed books; free advice - taking care of yourself; free help & free listings on Yellow Pages for Kids; winter schedule - Wrightslaw programs in FL, NJ, NY, IN, MO, AZ. December 14, 2004 - IDEA 2004 - schools cannot require kids to be medicated; answers to your questions about passing grades, IQ scores, eligibility; how to get services by asking questions; why gatekeepers say 'no;' free shipping & price cuts in our holiday special; when is a child entitled to a personal aide; behavior & discipline info; winter schedule - Wrightslaw programs in FL, NJ, NY, MO, AZ. December 7, 2004 - President signs reauthorized IDEA; highly qualified special ed teachers under IDEA 2004; help for teachers, principals, paraprofessionals; free shipping & price cuts - holiday special; what is your NCLB IQ? ; free pub - The Road to Nowhere; winter schedule - Wrightslaw programs in FL, NJ, OH, NY, MO. November 30, 2004 - How IEPs will change under IDEA 2004; Rule 11 & attorneys fees; download full text of IDEA 2004 compared with IDEA-97; Holiday Special - prices cut, free shipping; independent educational evaluations; what you should know about evaluations; Wrightslaw programs in OK, FL, NJ, OH, NY, MO. November 23, 2004 - IDEA 2004 update - changes to key statutes; purposes of IDEA; definitions changed; transition services; free pubs about transition & your child's IEP; help for college students; rights & responsibilities in college; scholarships. November 9, 2004 - Failure to include regular ed teacher on IEP team is fatal; procedural safeguards & parent notice; top 10 articles for October; IDEA Update - negotiations continue; sample letter with background info & resources; educating all children; find help in the Yellow Pages for Kids. November 2, 2004- Reading and research; double-dipping - kids with disabilities and Title I reading programs; effective methods to teach reading; teaching adolescents to read; teaching late bloomers; retention as an intervention; caselaw about reading; Wrightslaw programs in VA & OK.
October 26, 2004 - What is your IEP IQ? ; your child's IEP - practical & legal guidance; teaching a child to read: Reading First or special ed? ; strategies for IEP goals & objectives; how to use a parent IEP attachment; recommended books about IEPs; symposium on educating at-risk children. October 19, 2004 - Child with 504 plan is failing, school won't help; who is eligible for protections under Section 504 (not IDEA); answers to your frequently asked questions; advocacy 101 - gatekeepers & why schools say "no"; IDEA reauthorization news; free professional development courses for teachers; free tutors for kids. October 12, 2004 - How to get a certified reading teacher; feds publish inaccurate info on graduation rates for disabled kids; court overrules decision in stay-put case as "unfair to parents"; due process hearings; Surviving Due Process; winter schedule - Wrightslaw programs in VA, OK, FL, NJ, OH, NY. October 5, 2004 - Creative ways to help disaster victims; sending disabled kids home from school early; who is protected under Section 504; early reviews of Surviving Due Process: Stephen Jeffers v. School Board; rights of children in after-school programs; discrimination & Brown v. Bd of Education; free newsletters & journals. September 28, 2004 - Facing facts on reading; info and resources about reading for parents & teachers; do reading definitions in NCLB apply to general ed programs; NCLB for attorneys & advocates - reading instruction, research, assessments; new issue of The Beacon: Journal of Special Ed Law & Practice. September 21, 2004 - Special education due process hearings; how to resolve disputes - mediation, negotiation, litigation; how to prepare for a special ed due process hearing; how to put on a special education case; do parents of disabled children have rights in the workplace? ; find help in the Yellow Pages for Kids with Disabilities. September 16, 2004 - Getting help for a child with reading problems; what does law say about passing grades; can parent get child's IEP changed: do teachers have to provide accommodations in child's IEP; new issue of The Beacon on high-stakes testing; Wrightslaw programs in CT, VA, OK.
September 9, 2004 - How to know if your child is making progress; what is your bell curve IQ; 9 myths about testing; why parents should get an evaluation by an independent evaluator; Stephen Jeffers v. School Board - coming soon; how to find out if your child's teacher is highly qualified; online course about bullying & school aggression. August 31, 2004 - Special thanks from Pete & Pam Wright; psychologists object to advice about evaluations by independent evaluators; expert witnesses & psycho-educational reports; parent advocacy - what you should do and not do; why not the best? lessons about FAPE; online guide to special education rights & responsibilities; NCLB seminars; free pub about NCLB. August 26, 2004 - Advice for parent whose child can't read; teaching children to read; parents of child with autism reimbursed for ABA & private preschool; intensive early intervention & autism; Alaska high-stakes lawsuit settles; class action suit filed in NYC; find help in new Yellow Pages for Kids. August 17, 2004 - Success story: how I used school evals to get ABA therapy program; are children with ADD/ADHD eligible for special ed; useful pubs on evaluations & eligibility from USDOE; are schools required to give personal info to military recruiters; how will NCLB affect you? August 12, 2004 - Planning is key to success; success story - why plans are our safety net; assertiveness & effective parent advocacy; managing your child's documents; "Paper Chase" in The Beacon; advocacy training programs in Indianapolis, Hartford CT, Virginia Beach, & Oklahoma City. August 3, 2004 - Advice about "10-day notice letters"; how to use letters to persuade & prevail; how to deal with confusing terms & jargon; choreography of trial preparation; representing the special ed child. July 28, 2004. Why you should request a paraprofessional, not an aide; how to request a one-to-one parapro for your child; FAQs about related services; how to get FAPE and avoid due process; Partners in Policymaking; free online advocacy course for parents. July 21, 2004 - Dealing with a hostile school environment; resolving problems & protecting relationships; Letter to the Stranger & changing perspectives; learning to negotiate & persuade; legal decisions about advocacy by parents; Getting to Yes, How to Argue and Win. July 14, 2004 - Discipline - still a hot topic; can the school suspend or expel a child with LD/ADHD; what you need to know about functional behavioral assessments; caselaw on discipline; free pub - IEP Team's Introduction to Behavior Assessments & Intervention Plans and more; Why Johnny Doesn't Behave - 20 Tips from Experts. July 7, 2004 - New decision from 8th Circuit ends parental nightmare; responsibility for providing FAPE; alternatives to name-calling & other bad behavior; mistakes parents make; when parents and schools disagree - how to resolve disputes; school leaders testify in favor of NCLB. June 30, 2004 - Winner of the "Name That Video Contest"; IDEA Reauthorization Update; side-by-side analysis of bills to reauthorize IDEA; find out how your school is doing under NCLB; Special Ed Muckraker needs your help; Bridges4Kids News Digest. June 23, 2004 - How to get an appropriate education and avoid due process; encouraging parents to be adversarial; teachers and low expectations; advice about law school; advice about moving; objections to Boot Camp as "militant." June 16, 2004 - Summer school for parents; learn about legal rights & responsibilities; find help in your community; join a parent group; take action, help others, start a FETA Study Group; Reading Recovery & IEP problems. June 8, 2004 - Summer school for parents; get a psychoeducational evaluation; measure child's progress; learn about SMART IEPs; what people are saying about Wrightslaw books; get your state academic standards. June 3, 2004 - Summer school for parents; take care of yourself & your family; write a thank-you note; develop your master plan; learn to negotiate; learn about child's disability and effective education; Boot Camp in Sacramento; help from Yellow Pages for Kids with Disabilities. May 25, 2004 - Evaluations; how to use an evaluator; factors to consider when selecting an evaluator; preparing psycho-educational reports; mistakes people make - independent evaluators & advocates; top 5 articles in May. May 19, 2004 - Your role at your child's IEP meeting; progress in general curriculum; how to use info from evaluations in the IEP; child's IQ scores falling, school says he is "doing fine"; how a parent lobbied for an appropriate program; free pubs about IEPs. May 4, 2004 - A fresh look at special ed advocacy; mistakes people make - parents, schools; help for teachers, paraprofessionals, principals; Wrightslaw programs in AL, FL, WA, CA; free workshops for teachers; help from Yellow Pages for Kids with Disabilities. April 27, 2004 - Transition from school to work; legal requirements for transition in IEPs; follow-up letters and IEP meetings; how to use a parent IEP attachment; good cases about IEPs; free pubs about IEP and transition; Wrightslaw programs in MD, AL, FL, WA, CA. April 21, 2004 - How to write IEP goals & objectives; how to get an IEP revised; who is responsible for providing an appropriate program? 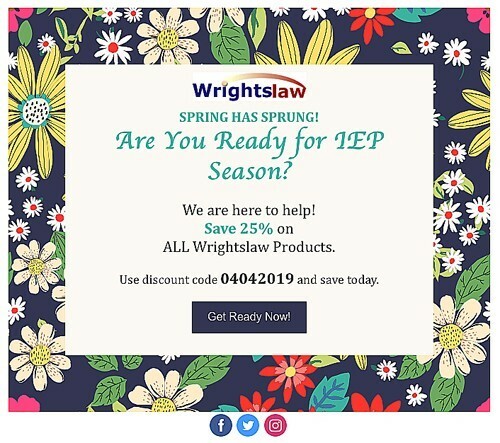 ; Wrightslaw books - easy on tight budgets; frequently asked questions about IEPs; teaching reading - special Ed or Reading First? ; IEP caselaw. April 13, 2004 - Advocating for your child - getting started; IEP goals & objectives; how to disagree with the school; Alaska students with disabilities graduate with diplomas; exit exams can be optional if you plan ahead; new issue of The Beacon about high-stakes testing. April 7, 2004 - One million dollar verdict for special ed teacher in retaliation case upheld; inside story of one million dollar verdict; lessons from the Settlegoode case - paper trails and letter writing; Council of Parent Attorneys and Advocates; Wrightslaw programs in AK, MD, AL. March 30, 2004 - What is your NCLB IQ? ; myths & realities about children with disabilities under NCLB; retention - special ed teacher needs ammo; IEPs and IEP meetings; NCLB news about testing, teacher qualifications. March 23, 2004 - Requirements about children with disabilities & high-stakes tests; high-stakes lawsuit filed in Alaska; exit exams optional if you plan ahead; next issue of The Beacon focuses on high-stakes tests, accommodations, modifications; March 24 is Call Your Senators Day; effective teachers, teacher education, closing achievement gap. March 16, 2004 - How to get the school to provide an appropriate reading program; review of special ed rights & responsibilities; FAPE; A Parent's Guide to NCLB; recommended books about reading and research-based reading programs. March 9, 2004 - Brent Staples, advocate for children; help for children with reading problems; Reading Library; future of NCLB; saving children & education reform. March 2, 2004 - Autism and PDD; debate about ABA /Lovaas therapy; functional behavior assessments & positive interventions; anatomy of special ed case; ABA/Lovaas caselaw; support groups & organizations. February 25, 2004 - School culture and the "blame game;" school won't evaluate child with 504 Plan, says child must fail; accommodations and modifications on high-stakes tests; next wave of special education litigation; high-stakes testing flyer; subscribe to The Beacon; Wrightslaw programs in MI, NH, AK, MD. February 19, 2004 - Writing IEPs for success; IEP resources and help; letter from advocates about state returning federal funds; NCLB news; free pubs about IEPs, reading, bullying, private school students, behavior & discipline; Wrightslaw programs in IL, IN, MI. February 11, 2004 - How to prepare for mediation; how to resolve disputes by negotiation, mediation, litigation; FAQs about mediation; learning to negotiate; mediation & the lighter side of special ed. February 3, 2004 - What is your IEP IQ? ; IDEA reauthorization - advocates speak out, organize, demonstrate; 8 steps to better IEP meetings; how to use a parent IEP attachment; IEP info and resources; Wrightslaw programs sell out. January 27, 2004 - States sit on 5.7 billion in federal funds; how to hire a lay advocate or attorney; how to work with an educational consultant or evaluator; strategies for getting help - database of service providers; Council of Parent Attorneys and Advocates (COPAA) conference in San Francisco; Pete and Pam go to Midwest, provides special Ed legal and advocacy training. January 20, 2004 - Reading at Wrightslaw; information and resources for parents and teachers; tutors, training, & research-based instruction; free pubs about reading; caselaw about reading; Children of the Code; put Wrightslaw training on your "to-do" list. January 14, 2004 - States send millions in education funds back to feds; what to expect from an evaluation of your child; what you need to know about evaluations; working with evaluators and educational consultants; tests to evaluate reading problems; put a Wrightslaw training program on your "to-do" list. January 7, 2004 - New site - No Child Left Behind at Wrightslaw; how NCLB will affect you; NCLB law, regulations, guidance publications, policy letters; reading and research-based instruction; No Child Left Behind information directories; education statistics & report cards; flyers, fact sheets, brochures, free newsletters.